Discussion in 'Fins, Masks and Snorkels' started by Jkratt14, Apr 12, 2019. Can't explain why my dishwasher works every time I buy a new mask, but I use a potwashing program at @ 190°F, a top quality detergent tab, and my washing program runs slightly over 120minutes. Cleaning the inside glasses with a hard toothbrush and Ultrabright toothpaste for 10-15 minutes also worked well, before I learned the dishwasher trick. Filling the mask with coke overnight in my hotelroom worked pretty good too, back when I bought a mirrored mask on vacation. Awesome, thank you for the input everyone. It will be for warm water dives. Definitely going to look into the Cressi Big Eyes Evolution. I noticed that there's an option for mirrored lenses, does this have any benefit at all or is it just a gimmick? Yes, the mirrored lens is a little gimmicky, but sometimes you can find value in a gimmick. I have a mirrored Cressi I bought when they first came out, and use it on my warm water dives during daytime. The first catalog it appeared in said it had "the same properties as polarized lenses" which is the main reason that I bought it. It doesn't... I called them on it... that verbiage went away the next year. So what does it do? First, they say it provides "HD vision" that "increases the vision's clearness by 15%." similar to that tint on Blueblocker sunglasses and all of those copper tinted masks that have been popular the last few years. I have never tried a comparison to see if I can tell the difference. I do think that it cuts down a little on the glare at the surface, but not due to polarization. The primary benefit I think I get from it is for photo/video. I think (can't prove) that some of the more skittish creatures I am trying to get close to have more tolerance for me and my camera when they can't see my eyes. This same glass is offered on several of their masks that are targeted to the skin diving / free diving / spear fishing segment, specifically for that "stealth" property, so it is not an accidental feature. I switch masks on night dives, no point then in even slightly reducing any transmission of light. Bottom line is I do like mine and continue to use it, but can't provide a compelling reason to spend the extra $10 or so. Bon Ami is the best stuff I’ve ever used to clean a new mask. It also works wonders on auto glass to get water spots off. I wet down a rag then shake a little Bon Ami on it, rub it around on the glass then rinse. Had a shop toss in a bottle of 500PSI mask cleaner. Yea, whatever. One day I was looking at that bottle and thought I would try it. It actually worked really good. Yes, a product designed for a purpose actually works. No flaming needed. I agree with all the fit recommendations. I have tried many masks over the years and always keep comming back to an inexpensive ScubaMax MK153. Actually I made the next step in my commitment to this mask. I sent it out last week to have prescription lenses put into it, I can't wait to see better underwater. This it the same mask that I'm wearing in my avatar. Try the Mako Mini mask. I bought one as a low volume spare to my Hollis M4 Frameless Mask, which I do like very much, but now find I use the Mako primarily, and the Hollis is now my backup. 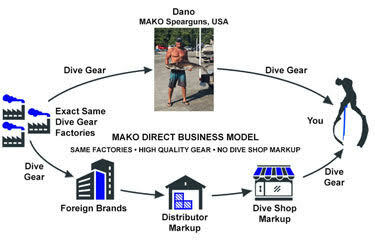 One great feature about the Mako is that you can return it, no questions if you do not like it for any reason, even after using it in the water, Mako will take it back for a full refund. I think you would be hard pressed to find LDS or online retailers that will do that for you. Could you weigh in on whether this is the same mask as the MK153: Taiwan Mask | ITADA INTERNATIONAL CO., LTD. I'm considering buying one, since many people are praising the Scubamax on Scubaboard.